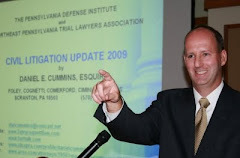 I presented a continuing legal education program at yesterday's Luzerne County (Pennsylvania) Bench Bar Conference on the topic of Civil Litigation Update 2011. Anyone desiring a free copy of the written materials (66 pages) I drafted for this program, as well as for the Auto Law Update program, may contact me at dancummins@comcast.net. Any insurance carriers who may wish me to present an hour-long powerpoint Update seminar to their claims professionals may contact me at the same email address.